Mailing activities such as the distribution of brochures, daily invoices and monthly statements in companies, public administrations, marketing agencies, etc. are intensely time-consuming. It is not only the actual creation and printout that require a lot of work, but also the final processing - including manual folding - that takes time and creates ‘bottlenecks’. This is the issue under which the Test and Economy Magazine FACTS checked our office folder IDEAL 8306 in a very detailed way. 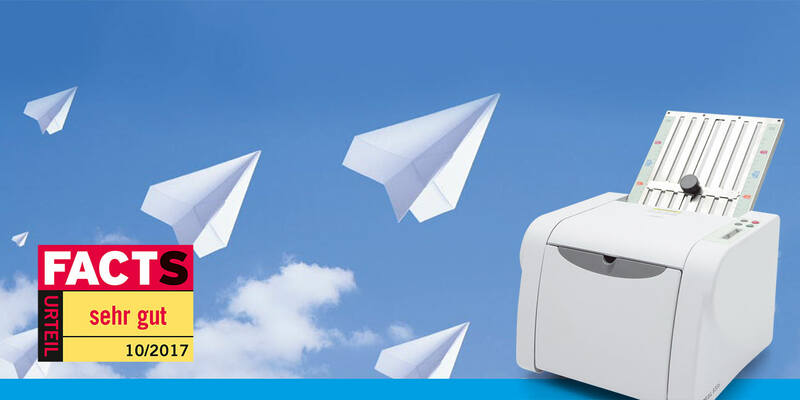 “The folder IDEAL 8306 ensures smooth, precise and cost-effective workflows in mail processing. All tests were completed successfully. Also, this machine convinced the FACTS editors by its general features, user-friendly operation and the favourable price”, concludes the FACTS test editorial. This conclusion was endorsed by the IDEAL 8306 being awarded with the test result “very good”.